With trout season opening day at April’s end, we check in with legendary river cleanup leader Dr. 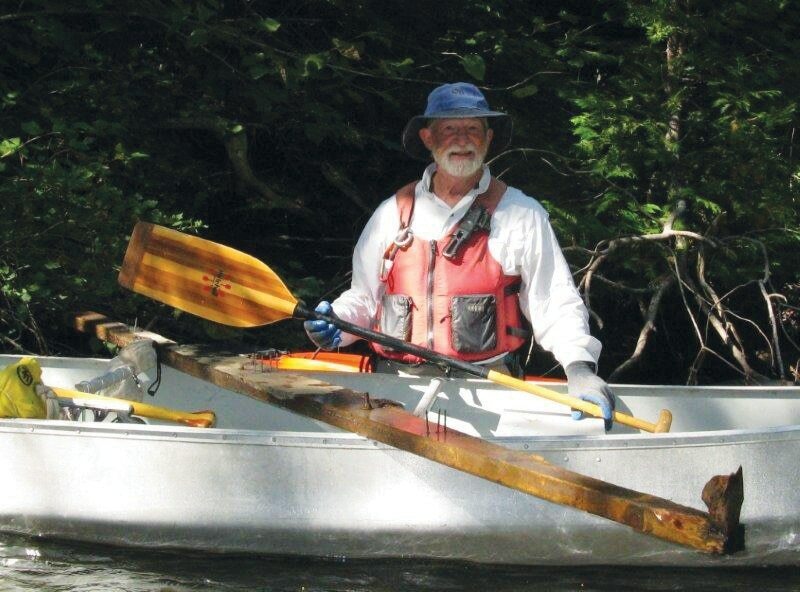 Norm Fred, the man behind Boardman River Clean Sweep, for inspiration and advice on how we can help keep our favorite streams free of trash and full of fish. So, picking trash out of rivers … how did that become your thing? I used to be a dentist, and I spent most of my time indoors working. And one day when I was about 56, my brother-in-law wanted to teach me fly fishing up on the Boardman River, near the Forks. I was amazed. I said, “This is the Boardman River? It’s so gorgeous!” Till then, I thought the Boardman River started at the dam in downtown Traverse City. But every time we’d come around a bend there’d be a log in the river and a bunch of garbage jammed up against it. It was terrible. You started picking up garbage right then and there? It was a bit later. About ’92 I had a patient who was a Boy Scout and he told me there was a National River Cleanup Day. So for a project, we took my canoe down the Boardman and pretty soon we had more garbage than we could fit in the canoe. When did you go bigger with it, get more people involved? Jocelyn Trepte and I planned a cleanup called the Boardman Clean Sweep in 2005. We thought we were going to get about 10 people to show up. But 80 people showed up, and we got three full dumpsters’ worth of stuff. But we didn’t have any actual dumpsters, so we went around town putting the garbage into business dumpsters, sometimes without permission. There was so much garbage, we didn’t know what else to do with it. Now we rent dumpsters. How much do you get these days? Now we don’t even get enough to fill the bottom of one Dumpster, because the river is so clean people don’t throw garbage into it. It’s like if you walked into somebody’s living room and there was a pile of beer cans in the corner, you’d throw your beer can on the pile. But if there’s no pile, you wouldn’t throw a beer can in the corner. And eventually, you ventured on to other rivers? Yes, we have branched out and now coordinate cleanup on 19 rivers in Northern Michigan. And many organizations are involved. A Trout Unlimited group does the Maple River, a group near Kalkaska is taking over some of the Manistee River. We are trying to foster local groups to take over the cleanups. What’s the best way to join in the cleanup? I post all the cleanup dates on our website, brcleansweep.org, and people sign up for them. We do cleanups May through October. I want to know people’s skill levels because safety is very important, so I’ll ask if you’ve paddled a canoe and what other experience on the water you might have had. But everybody is welcome and there’s no charge! Can you say my wife is the greatest woman who ever lived? It would help me out at home.